Star Wars: Dark Forces, legendary space shooter from 1995 by LucsArts. The game was made for MS-DOS, and therefore requires an emulator, like DOSBox, to run on a modern PC with Win7/8/10. However, with this program you can run Dark Forces directly from Windows instead of using an emulator, and play with 3D acceleration in scaled full-screen at any resolution. 2: Unpack into the Dark Forces game-folder. 3: Make a shortcut to "DarkXL.exe". Us it to launch the game from now on. 2: Unpack into the DosBox folder inside the Dark Forces folder. 3: Rename "DarkXL.exe" to "dosbox.exe". That way you can use your regular Steam shortcut to launch the game. 4: Launch "XLengine_Launcher.exe", and put in the right path by Dark Forces. 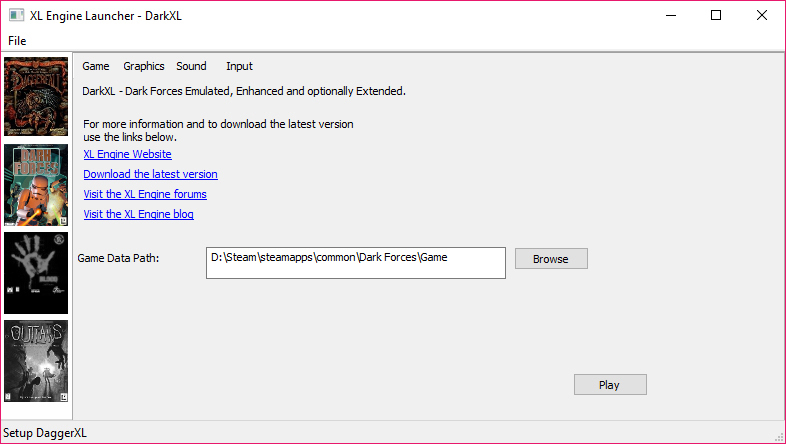 If you get an error message when trying to start the game via the Steam shortcut, then copy all the game files into the root folder as well, so the full game is both inside "Dark Forces" and "Dark Forces/Game". That's it. Star Wars: Dark Forces is now ready to run in full-screen with 3D acceleration and mouse-look, just like modern shooters. Game info: Star Wars: Dark Forces was the first game in the Jedi Knight series, and the first serious first-person shooter game for the franchise. It was both developed and released by LucasArts in 1665 for MS DOS. The story follows Kyle Katarn, a mercenary working for the Rebel Alliance, who discovers the "Dark Trooper Project". The Empire is planning and developing of a series of very powerful new droids and some better armors for the storm-troopers. The game uses it's own engine, the Jedi game engine, which has many similarities with the DooM engine. Dark Forces received good reviews from both fans and critics, and was especially praised for it's level design. Star Wars: Dark Forces follows the storyline without player-choices. The player starts every level with a mission briefing and/or a cut-scene. Each mission has specific objectives, which must be completed. The missions take place in different environments in the Star Wars universe, including a Star Destroyer, Jabba's space yacht, and the planet Coruscant. The game was actually the first FPS to introduce jumping and looking up and down. These new features brought more depth and freedom to the game, and has become standard for FPS games today. This, plus the fact that the game had a story, made it different to Doom and most other FPS games at the time. The fighting and shooting mechanics are pretty standard, and the way the level design works is also typical for it's time. The game does however have a certain charm that makes it worth playing today, even though time has caught up with the graphics and game-play. Dark Forces is one of those titles that will be remembered, both because it was very solid when it came out, but also because it was the first serious Star Wars game. It was a MUST HAVE in 1995.